I'd been waiting a long, long time to visit the islands of Thailand, and the popular Chaweng Beach on Koh Samui was my first stop. I spent a week there, before moving on to the real party scene on Koh Phangan. 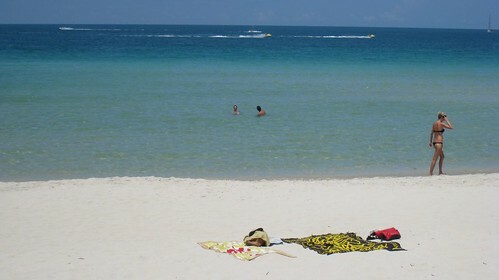 In April, I visited Nikki Beach Koh Samui Bunglow Resort and found it very attractive. The rooms, service and almost everything were lovely there. I went there for a business meeting and after a hectic schedule, I took some days off from my meeting.I never felt alone while staying in that resort. The environment was so lovely and everything was just like what I expected from a good resort. Now I heard a news that Nikki Beach is arranging the best new year party hosted ever till date in Thailand Beach Resort at there own resort. This grand new year party starring blonde girl from London DJ RO-Z for their musical event on new year eve. I am planning to go over there and spend some quality time there. I am looking forward for this lovely trip once again. I think as usual, this time they will rock the Thailand Beach resort with ease. They have lots of verities in their New Year menu to make the visitors satisfied. In the Gala dinner schedule, the want to provide Shrimp and Lobster Cappuccino, Citrus Marinated Sea Scallops, Baby Organic Greens and many more in the vegetarian section. In the non vegetarian section they are coming with their new menu like Center Cut Grain feed Beef Tenderloin, Pan Roasted Snow fish Fillet and many more. But the hidden gem is their exclusive own menu is Nikki’s Chocoholic Temptation Plate which is made of Chocolate dipped strawberry, warm chocolate lava cake, chocolate milkshake and vanilla ice-cream. In the drink section they are different category like Rum, Vodka, Tequila, Gin, Whisky and above all Champagne. There are many brands in every category under their sleeve to give the visitors entire satisfaction.